The following statements about spiritual angels are extracts from the first spontaneous paranormal survey conducted by Psychic Revolution. These accounts have not been edited but any information that may identify the original contributor has been removed. As told of my husband and my dream about our son, I myself had seen our daughter (not a dream) prior to her conception also. She appeared to me after getting settled in bed for the night. I felt something bumping the foot of the bed and thought it was our 3r old son. I raised up and looked down and saw what appeared to be about a year and a half to two yr. old little girl with curly red hair, blue eyes and a very sweet yet onry look on her face. At that time we were not thinking of having anymore children. I had told my husband about it and we kind of put it in the back of our minds. 2yrs. later there was this force driving me that I needed to have one more child. I became pregnant and I KNEW that it was this child and her name was … She was born … with red curly hair and blue eyes. She appears to me as what is I have heard a “Crystal Child” is. Her eyes read my mind and our thoughts are very intwined. I have 3 other children whom I am VERY close with, yet never have experienced this type of level if you will, with them. … has such a familiarity about her I would almost swear she was my gaurdian angel that I had always felt presence of. Now I don’t feel that angels presence since her birth. I believe she was with me since I was born, spiritually, but now physically. I was late teens, and in Salisbury Cathedral, a beautiful church in England. I was visiting as a tourist with my family. We were listening to the boy’s choir practicing the most beautiful singing. We watched awhile, and then I suddenly saw the air shimmer a bit up near the alter, where the boys were singing. I then saw rows of beautiful angels, in rows behind the boys, with heads bowed and hands folded in prayer. They were tall, much, much too tall for the room they were in, somehow. They seemed two or three stories tall. 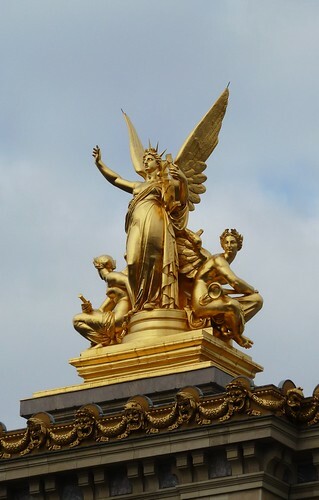 They had wings, white robes trimmed with gold, very traditional looking angels. I watched them for a little and then could no longer see them. We all left the cathedral, and I was the last to leave. 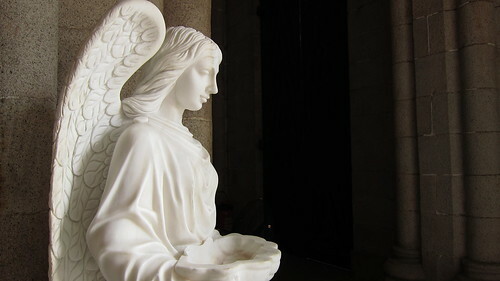 Then, as I saw each of my family leave the cathedral, I saw an angel (whom I assumed to be their guardian angel) turn and follow them out, just behind them. This was a beautiful, amazing experience) in the truest sense of the world), and one that has comforted certain members of my family, myself included. The night before my grandfather died my mother and I were visiting him in his hospital room, and he was suffering and we knew he wouldn’t stay for much longer. I was facing the bed and i felt a breeze and heard a rustling. I turned around and I saw an angel settling in to one of the chairs. I started crying because I knew it was time for my grandfather to go and he passed on several hours later. I believe the angel was there to guide him on to the next step of his journey. When I was around eight years old, I witnessed an angel (perhaps Jesus?) outside a bedroom window early one morning on a cloud in the sky. He was dressed in a robe, tied with a belt and appeared translucent in shimmering light. He seemed to be watching people on the earth with concern. A light would radiate from his body and arms toward the earth. At one point he knelt, turned, and prayed, arms uplifted to the sky. And then he turned and had a large book and slowly turned pages, placing the palms of his hands on the pages, once again radiating the light from his body to the earth. I watched this for about 1/2 to 1 hour it seemed. It was beautiful! My best friend was staying the night over at my house, like she had many times before. We were in the living room on a pull-out bed trying to sleep, which is hard to do when she’s over (we talk a lot, and still do). I happened to glance at the TV, which was off at the time, and happened to be angled so it reflected the hall doorway. In the reflection of the doorway I saw a woman who was around 5’5″ with very curly dark brown hair that reached just below her shoulders. I couldn’t make out her face, but she was wearing a long while dress like a nightgown. She wasn’t scary though. She was calming. I turned to my friend, who was closest to the doorway and told her to look at the TV. She saw the woman too, but neither of us saw her in the doorway whe we looked. My friend believes to this day that it was a guardian angel. I don’t know what I believe.